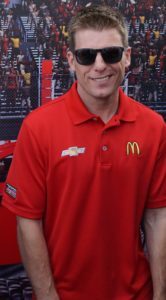 (NASCAR)—Joplin driver Jamie McMurray will make his 500th career start in NASCAR’s top competitive series tomorrow night at Richmond. It becomes a critical event as he works to remain in the running for a spot in the Chase for the Championship. But he might have caught a break because his closest competitor, Ryan Newman, was penalized fifteen points after last week’s race when his damaged car did not pass a post-race inspection. Qualifying for the chance to run for the championship in the last ten races of the year is simple—but complicated, even for those who follow NASCAR. So let’s look at what has to happen this weekend for McMurray to get into the sixteen-driver field. NASCAR rules say that any driver who wins a race and is within the top thirty in points automatically qualifies for the Chase. Eleven drivers are guaranteed because of their victories: Brad Keselowski and Kyle Busch have four wins this year. Kevin Harvick, Columbia’s Carl Edwards, Denny Hamlin, Martin Truex Jr., Matt Kenseth, and Jimmie Johnson each have two. Joey Logano, Kurt Busch, and Karl Larson each have one. A twelfth driver with a win this year is Tony Stewart, who is 27th in points. The thirteenth winner is Chris Buescher, who is barely in thirtieth place in the standings. Until the penalties were announced earlier this week, McMurray was up on Newman by only seven points. If Newman wins the race tomorrow night, he automatically is in the Chase field. If Buescher stays in the top thirty, only two spots will be left with Elliott, Dillon, and McMurray fighting for one of those two. If McMurray wins, he’s in automatically and the competition switches to Elliott, Dillon, and Newman with Newman a long shot. If Newman wins and Buescher drops out of the top thirty in points, Elliott, Dillon, and McMurray make the Chase. If neither wins and if Buescher stays in the top thirty, McMurray has to finish nineteenth or better to make the Chase no matter what Newman does. Even if Newman finished second and gets a bonus point for leading one lap, the most points he can finish with is 662 points. Nineteenth would leave McMurray with 664. But there are wild cards. A driver who has not won yet this year and who is not now in the top sixteen but is in the top thirty would make the field with a victory. Kasey Kahne, Paul Menard, and Greg Biffle (who also makes his 500th career start Saturday), for example, have NASCAR career victories but haven’t won for a while. The penalty has given McMurray some breathing room as he tries to make the Chase for a second straight year. Richmond is not one of his better tracks. He has a career average finish of 20.1 there. Newman has averaged 11.7. Even if they hit their averages, Newman won’t be able to overtake McMurray. Current history seems to favor McMurray who has finished fourth in half of the last six Richmond races. His worst finish in those six races is sixteenth. Newman also has three top-tens in the last six races, with a best finish of third. His other top tens were ninth and eighth. Both McMurray and Newman have run in the top twenty in 21 of the 25 races so far. Both have finished below thirtieth once. The green flag is scheduled to drop in Richmond at 6:43 Saturday evening.